As the Round of 16 begins in the Brazil 2014 World Cup, there is another American breakthrough. It's not the fact that the USMNT made it to the second round in two consecutive World Cups, or that they escape the Group of Death. It's Mark Geiger, the American referee from Major League Soccer. Today he became the first American to get assigned to a Round of 16 match: France-Nigeria. 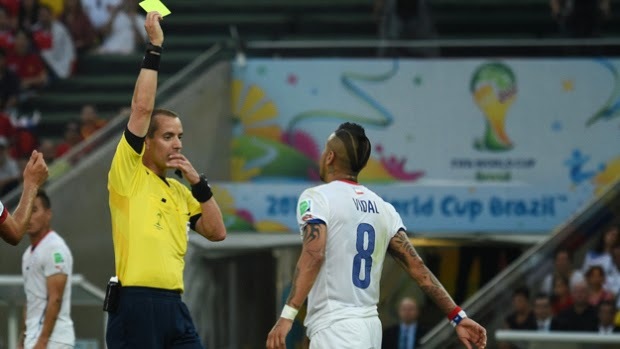 So we must give credit to him for his poise in the various games he has already refereed in this World Cup: Colombia-Greece and Spain-Chile. The latter one was particularly important given its serious implications in this tournament, i.e. Spain getting knocked out. Geiger has had a steady rise through the ranks of American soccer: from being a math teacher in New Jersey to his time in the A-League in 2002 to MLS in 2004, to getting FIFA-listed in 2008, to the London Olympics in 2012, and now at the 2014 World Cup. He will now dictate how one of the marquee teams, France, conducts its business on the pitch alongside the African champions, Nigeria. The French have a tendency to commit certain egregious offenses: Zidane's headbutt in Germany 2006 and Henry's handball in qualifiers, 2009. Nigeria can get physical. It will not be easy for Geiger. Let's celebrate this latest accomplishment in the development of American soccer. We're not only showing the world we know how to play. We're also showing the world we know how to manage a match in the most difficult international stage: the World Cup. Congratulations, Mark Geiger. Hopefully we'll see more of you later in the tournament.